A mighty little flashlight that multi-tasks! 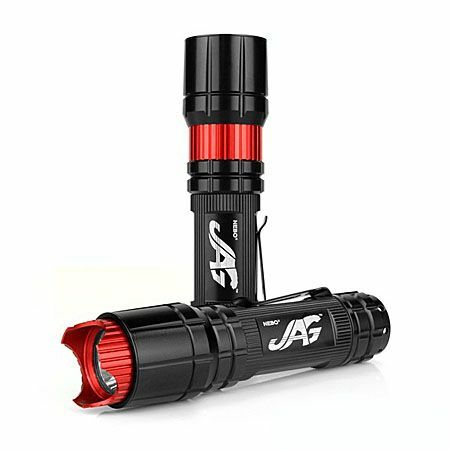 Our new JAG Flashlight uses a high power LED to output a 210 lumens of intense white light. It has (3) lifesaving modes (100% light, 50% light and Defensive Strobe) which are controlled by a "glow-in-the-dark" button. This easy to use button utilizes hard and soft touch technology to cycle through the settings. The impressive looking JAG has a dual exterior. Upon first glance it has a very smooth bezel, yet when used for self-defense the spring-loaded PROTEC Shield™ retracts, exposing the mean, aggressive self-defense face.